If you think that exploring Borobudur and Prambanan when you are in Yogyakarta is not for you anymore, there are actually some other ways that you can do to enjoy this city. Instead of hiking the famous Mount Merapi, opting for Mount Nglanggeran must be an excellent idea. 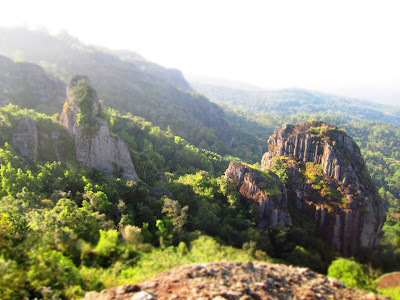 Mount Nglaggeran is a mountain located in Nglanggeran Village, Gunung Kidul. This mountain is also known as Gunung Api Purba or Mount Api Purba. It is about 30 km from the downtown Yogyakarta and is able to be reached via some possible transportation options. Basically, this mountain is perfect for you who need a great destination for a bit of hiking around Yogyakarta. It can be an affordable choice for your tour as well since the entrance ticket of this place is so cheap. Then, what are the things that make this place special? There is no doubt that you will be able to enjoy such striking view once you reach the summit of this mountain. After half and an hour of trekking only, you will be able to see that spread of clouds, green field and a range of mountains afar that form such unique shape. For you who love to stay overnight on the summit, you will have a chance to watch the ocean of light in front of your eyes at night. The sparkling stars plus the dazzling lamps in distance creates such a wonderful and romantic scene for those who decide to do camping there. For sunrise and sunset hunter, Mount Nglanggeran will become a perfect destination as well. You can decide to leave early to get to see the sunrise of Mount Nglanggeran. You can also consider hike in the afternoon to watch sunset and the romantic scene of Yogyakarta’s city light at night. It must be great if you can visit some other great places instead of hiking Mount Nglanggeran alone. Since Gunung Kidul has a huge variety of popular tourist destinations, it will be a good idea to visit one or two destination there. For your recommendation, you can consider visiting Kalisuci Cave first before hiking the Mount Nglanggeran. Kalisuci Cave is famous for its cave tubing activity that is so much unique and worth checking for. That’s why adding this to your itinerary won’t hurt you. In this case, you can start by visiting Kalisuci Cave in the morning and then continue to hike Mount Nglanggeran later in the late afternoon for sunset and dazzling scene at night. Now, you have known another fun thing to do in Yogyakarta instead of exploring Borobudur and Prambanan Temple only. If you need a hand to get the most of your trip in Yogyakarta, you can consider visiting www.jogjabromotour.com. Here, you will discover various tour packages that are full of exciting and fun things to do around Java Island.